CF undercarriage parts are manufactured under the strictest quality management and are distributed widely in markets of Asia, Middles East, Latin America, Africa and Europe. CF has always been associated with quality within the industry earning an excellent reputation in Mining, Forestry and Construction industries. We cover and stock the widest range of undercarriage parts applicable for most makes and models available in the market. CF believes in keeping up to the demands of the market. There is an ongoing process by our technical department to study and apply the latest technology improvements in the industry in the area of process equipment, manufacturing know-hows and material types. This is to ensure that our quality can be stabilized and constantly improved over time to provide exceptional value to our customers. 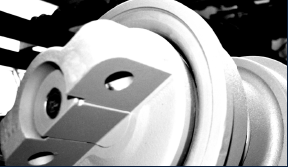 In partnership with some of the world's leading manufacturers who produce for OEM to some of the world's renowned brands, our customers can rest-assured to be able to obtain undercarriage parts with a quality compatible to the OEM at a competitive price. Our manufacturing partners are certified by world recognized certification companies to ensure our management, production, quality and environmental systems are in check and consistent to world's standards. CF quality management processes are executed within the manufacturing facilities in strict adherence to established quality perimeters. The different stages include incoming quality check on raw materials, in-process quality monitoring during production ensure consistency of our products and random checks on out-going goods will meet or exceed market expectations. Our state-of-the-art quality testing equipment will give our customers the assurance on the quality of the products we promised. CF's track chains are designed based on sustainability, durability and productivity. Our manufacturing facilities are keeping up to the market's available technology for the process of forging, machining, heat-treatments and assembling. CF track chains are interchangeable to the original equipment parts through our conscientious effort to ensure our design to be compatible. 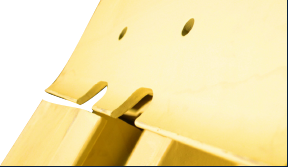 Available in greased / seated and sealed / lubricated to most makes and models of excavator and bulldozer applications. Our expertise and technical know-how makes CF your choice for supply of single and double flange bottom rollers and carrier rollers for crawler machines with operational weight between 3 tons to 300 tons. Our usage of specialized seals, lubricants and additives will maximize roller's components' working life and ensuring efficient operation in the most demanding working conditions. Our R&D department is constantly improving and developing new ways of improving quality standard in order to provide better value to our users. CF has an extensive experience in developing and producing high quality crawler shoes for excavator and dozer applications. CF shoes offer excellent lifespan over competitors whilst achieving competitive pricing giving outstanding value to our partners. 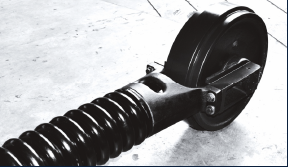 CF's quenched and tempered track shoes are of superior quality withstanding the hardest working conditions enabling our users to reduce downtime and increase efficiency. Our wide range of track shoes gives our users proper selection for different applications so as to maintain better machine performance and longer undercarriage life. The width of our track shoes is at the range of 12inch - 39inch / 250mm - 1200mm. CF sprockets are precision cast according to OEM specifications. Using the latest technology of hardening to ensure durability while engaging the track link assembly. 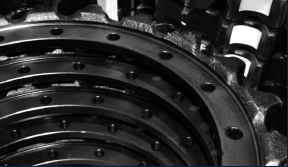 CF segments and sprockets are stringently checked along our manufacturing process to ensure that they meet these specifications and market expectations. Our wide range of sprockets is suited to most makes of excavator and bulldozer applications with the range of 90mm - 228mm pitch. 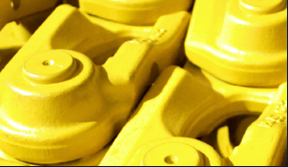 CF idlers are produced with superior manufacturing processes including induction hardening castings which will provide increased impact and wear resistant. The hardened wear surfaces give it strength while maintaining a ductile core that is able to absorb impact. The CNC machined parts are precision produced to ensure the parts are consistently fit and are of optimum quality. Cast idler groups come assembled with heavy-duty seal groups, shafts and brackets.